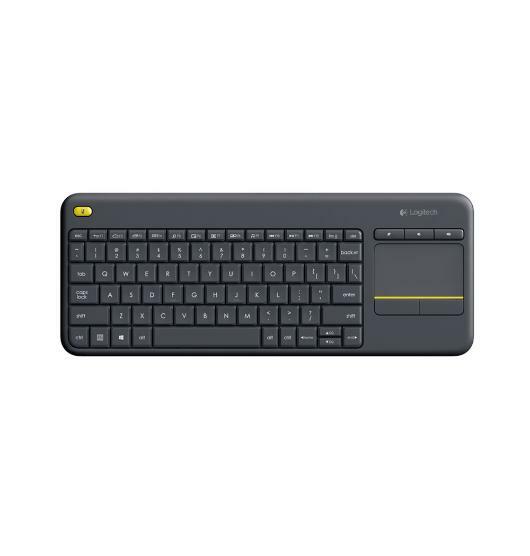 The Logitech Wireless Touch Keyboard K400 Plus lets you experience PC-to-TV entertainment the way you Watch video, browse the web, chat with friends and much more. The all-in-one keyboard with touchpad ends the hassle—and clutter—of multiple devices. And a 10-meter (33-foot) wireless range ensures your fun won’t be interrupted. Comfortable, quiet keys and a large (3.5-inch) touchpad make navigating entertainment effortless. Even setup is a snap thanks to the tiny, plug-and-play Unifying receiver. The 18-month² battery life means you might even forget the keyboard needs batteries. 1 Wireless range may vary depending on operating environment and computer setup. Assumes up to two hours typing per day. Actual battery life will vary with use, settings and environmental conditions. Compact 2-in-1 convenience at a sharp price. The feature-rich Logitech K400 Plus keyboard really impresses with its excellent combination of thin profile, low mass and compact size, making it an unobtrusive addition to your living room and providing comfortable use from the sofa. The accompanying unifying receiver effortlessly connects the keyboard wirelessly to your device via a standard USB port, with the manufacturer claiming an effective range of up to 10m. The compact track pad offers precise navigation and an easy point-and-click action with the dedicated left and right click buttons just below the pad. Dedicated media buttons above the track pad and left-click button on the top left-hand side of the keyboard add extra convenience, while the travel style of the keys is pleasingly long and firm like on more expensive models. The 12 function keys offer a comprehensive range of laptop-like controls and the keyboard features the usual action keys. The K400 Plus also features a dedicated on /off switch at the back of the keyboard which saves your batteries from losing power unnecessarily when you're not using the keyboard. The K400 Plus provides compact 2-in-1 touchpad and QWERTY convenience at a sharp price.